Fans of William Peter Blatty who are expecting a supernatural mystery in the vein of The Exorcist or Legion may be disappointed in his first full-length novel in many years. Dimiter is a low-energy mystery/thriller about deep cover spies, set in Albania and Israel. Fans of espionage thrillers, however, will not be impressed with the novel’s slow pace, old school intrigue, and lack of originality. 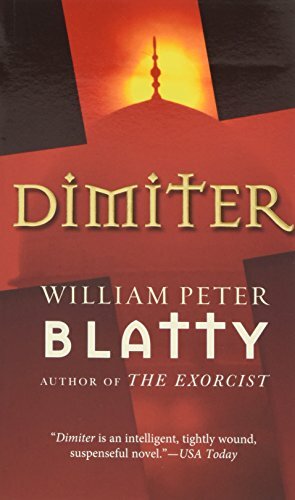 As with most of Blatty’s novels, Catholic-Christian theology is predominant, and Dimiter explores themes of regret, repentance, and forgiveness. Although Paul Dimiter is a spy and assassin known as the “agent from Hell”—or so we are told in the narrative—our introduction to this mysterious persona comes in the lengthy Part One of the novel. It’s 1973, and a man suspected of murder is being tortured by ruthless Albanian interrogators led by the complex Colonel Vlora. Their prisoner refuses to speak and does not seem to respond to even the worst tortures imaginable. While this first part of the novel seems promising, by the time we have reached the end of it we are still in the dark about the identity of the prisoner or his relevance to the rest of the story. The disjuncture of the remainder of the novel makes one suspect that Part One had been abandoned to a desk drawer and then picked up and extrapolated into a novel several years later. After the 70-page Part One, the novel shifts locations in Part Two to Jerusalem, where there is an almost uneventful 38-page chapter about a new character, Doctor Moses Mayo, who seems to have no apparent links to the previous section. Then another character named Inspector Meral is introduced, along with his investigation of a charred body found by monks in the sacred Church of the Holy Sepulchre. Blatty’s convention of littering the novel with “transcripts” of dialogue does not turn out to be as effective as intended, and in fact tends to distance the reader from the story and the characters. The novel itself suffers from a kind of expository “tell don’t show” style, which makes it difficult to really enter the story and feel the characters come alive. After an almost baffling climax, one of the last chapters in the book actually has several of the characters explaining what happened, similar to how the old drawing-room mysteries used to have the police inspector explain how the murderer was identified. Those who loved Blatty’s earlier works, even his more obscure novels such as Twinkle, Twinkle “Killer” Kane, will only find a shadow of the brilliant ideas, plotting, and dialogue the author used to deliver. Let’s hope Blatty can still craft a novel that will measure up to his remarkable literary reputation. Garth Von Buchholz is an author of dark fiction, poetry, and nonfiction who is currently writing his first novel. His new book of poetry, Dark Eye Glances, will be published in 2010.